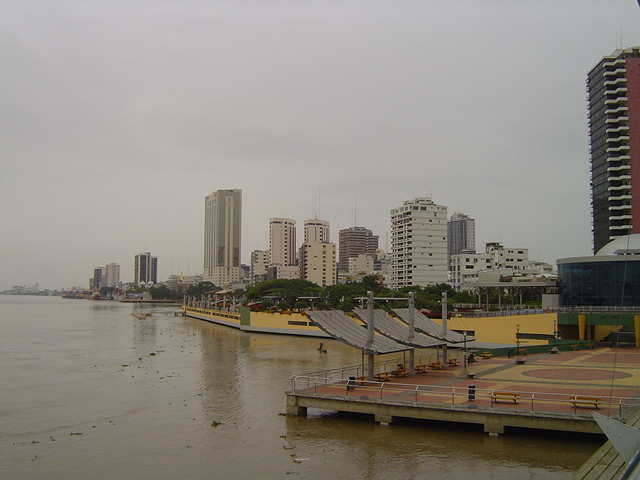 Guayaquil is a facinating city. I spend four hours walking along the Malecon, a 3.5 kilometre concrete seafront promenade, artistically designed by a team of Oxford University landscape artists. Attractions include a Yacht Club, several monuments of local interest, a mature eco-park teaming with birds and endemic plants, an Imax theatre and many children’s playgrounds. Loudspeakers emit pleasant background music as I idle through the park or lean on the railings to look out over the river. There are few people in the early morning and the air is clear and fresh. I walk to the very end, past the Imax theatre with its shapely edifices, and start up the 400 numbered steps to the Cerro Santa Ana. Bright colourful houses on either side; trinket shops, small cafes and soda shops. I am glad I started off while it was still cool. At the top I pause inside a little chapel. Guayaquil, the largest city in Ecuador, sprawls below me – a few skyscrapers rise near the Malecon, then a sea of roofs and faded buildings as far as I can see. Only the buildings on Santa Ana are newly painted, showing up in colourful sharp contrast. There is a lot to renovate in this city. I start down, pausing to buy a coke and bottled water at a soda shop, and sit watching an increasing number of people labouring upwards. A vendor sits a few steps below me playing patience with a pack of cards and inviting walkers to enter his souvenir shop. Nobody obliges. He accosted me on my way up, and I admire his persistence. I wander round his tiny shop and emerge with a necklace made from the soft polished wood we saw being turned on the slopes of Chimboraozo. He asks $8, and we eventually agree on $6. I wander back, by-passing the gardens. It is hot and I stop frequently to sit down. People are now appearing in their hundreds, thronging the promenade and music croons from the loudspeakers. Bursts of firecrackers break like gunfire throughout the city. Guayaquil is going crazy. Effigies of prominent people and movie characters are paraded along the streets, they appear outside houses and even ride in the backs of pick-up trucks driving helter skelter down the streets. Children hold out cups for money for their creations. The people burn effigies of their pet hates of the previous year, so they can start the New Year with a clean, fresh slate. Effigies of the current President are in abundance. I also see R2D2, Shrek and many others. It all comes to a glorious climax at midnight, we are told, when everything goes up in smoke, but we will be on the plane for Europe by then. I planned to visit the large cathedral next to the hotel on my way back, but it is closed for the New Year festivities. A few of us have an early supper together, and are disturbed by a loud bang in the street. We run to the window to witness the “burning” of the Manager of the Grand Hotel, amid much ribaldry. We wait in the foyer with our luggage at 6pm. Half an hour goes by, and there is still no sign of our coach. It has broken down, we are told, and our guide appears with two taxis and a pickup commandeered from a relative. We are bundled unceremoniously into the taxis, and our baggage thrown willy-nilly into the back of the pickup. The drivers are instructed to get us to the airport as quickly as possible, and they comply in one of the most hair-raising rides I have ever experienced. We arrive, and say a hurried goodbye to our guide who is anxious to return and join the festivities. The plane is practically empty, and we see in the New Year stretched out luxuriously over 2-3 seats apiece. Meanwhile, the death toll from the far eastern earthquake and tsunami rises, and the world reels under the weight of aid required for the survivors. This entry was posted in Travels and tagged Cerro Santa Ana, Ecuador, effigies, Guayaquil, Imax, Malecon, Oxford University, tsunami. Bookmark the permalink.